I have known Sylvia Shepherd all my life. She was following hounds on the Lakeland Fells long before I was born and I’m proud to call her a friend. In her youth she could hold her own on the fell with the male followers and her love of the hounds and knowledge of hunting shines through in these four songs. Like British soldiers at the front they mean to kill or die. These bonny hounds will have his brush before the close of day. Glena and old Rally are the best that ever ran. But give your kind assistance to this gallant old fell pack. The fells a delicate grey. 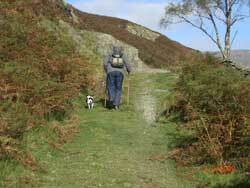 To hunt with the Coniston pack. Knows in the brackens hard by. Will hunt him through high crag and ghyll. Proclaiming the scent is breast high. As they press through bracken and rock. The steam rising up as they tussle. On the edge of a silvery rill. And I will call him my friend. We’ll drink to the Coniston pack. Save that some silly fellow he halloaed a hare. They climbed out Snow Cove and we heard them no more. They turned him in-bank and crossed back o’er t beck. They were pressing him hard so he’d no time to lag. The hounds screaming death and determined to kill. Out Long Green Head his way he did wend. Old Marples would collapse if ever he knew! And saw them at Croft Head marking to ground. While Kentmere re-echoed our glad Tally-ho! They chased him to a standstill and killed him in’t beck. And one fellow went in right up to t’ neck. We all know they’re second to none in the land. Funny thing, I remember this hunt, Dad came home worn out by trying to follow it on foot. Saw much of it, but not the conclusion, and the song is right - they spoke of it for years, and we kids didn’t believe it!! And of John Peel's view halloa. From the drag to the foxes lair. He can’t afford to slack. Unless stated otherwise all images and text on this site are copyright of the owner and may not be reproduced without permission.